Armikrogs memory puzzles and tenuous humour are a low point in the adventure game renaissance. Armikrog feels like a lot of the children’s games that were foisted on me by non-gaming relatives in the ‘90s, and I probably would have enjoyed it more if I were 15 years younger. At that age I was so excited to be playing games at all that I could innocently interpret a string of trivial but illogical obstacles as mysterious rather than a sign of shoddy production. Delayed twice, Armikrog is still chock full of padding, which is remarkable considering it’s just four hours long, closer to what an early publisher might pump out to fill a hole than a Kickstarted labour of love. The opening cutscene (that is, the Claymation cutscene after the hand-drawn musical number that attempts to introduce the story) got my hopes up. Pencil Test Studios’ Claymation is rich and fluid, the fingerprints in the clay that studios like Aardman edit out giving earthy authenticity to the stop motion. Spaceman Tommynaut and his psychic dog Beak Beak crawl from their crashed spaceship only to be accosted by the local wildlife in a slapstick sequence worthy of any Saturday morning cartoon. Then they run inside a nearby tower and slam the door on a promising start. Facial animation is the first thing I noticed was missing. When Beak Beak and Tommy chat, the sound spouts from a nonspecific location, but as there’s precious little conversation to begin with, you stop seeing it quickly. That’s odd for an adventure game. Usually they lean on dialogue to energise static scenes, but Tommy and Beak Beak proceed in silence, as if the introduction had interrupted a lovers’ tiff and they’re waiting for the other to apologise. Instead, you hear the occasional ‘thank you’ when Beak Beak weighs down a button or retches up an item he swallowed. It’s not just about flavour—muteness is a mechanical problem. Neither character will indicate when a problem requires their intervention. A button at waist height might need either Tommy or Beak Beak to press it, or it could need powering on elsewhere, but you can’t know unless you try with both. Every time. This is part of a larger problem that Armikrog has with clarity and finesse. It uses the default Windows cursor for a start, incongruous in a world of clay, and offers not the slightest hint at which objects are interactive and which are not or which character must do the dirty work. Worse, some buttons become interactive only when they’re good and ready for you, masquerading as static scenery until a later time. On others, the haste with which Armikrog must have been thrown together is betrayed by the tell-tale halo of a green screen. Maybe I’m grateful for the silence. “Greetings, friend! I am Abrah-ant Lincoln” chatters an ant in a top hat before clicking out a puzzle. That’s all he says. There’s also Thomas Jeffers-ant, complete with Declaration of Independ-ants (that’s one of mine) and what might have been a Roosevelt, but he doesn’t talk long enough to deliver an ant-based pun—the very height of humour on this baffling plane of existence. As to why there is a stream US presid-ants (hire me), Armikrog doesn’t much care. It’s the random comedic grasping of a child learning to structure a joke. Armikrog operates internal logic divorced from any school of human thought. It’s not about problem solving but completing the same set of isolated, artificial tasks three times over before the final showdown. It makes the first round of puzzles quite mystifying: push the orange monster to the right to open a secret door. Who cares why? Use the psychic dog to talk to the tentacle creature, who will deliver a cutscene entirely in a made-up language before spitting out a machine part. For reasons. Use a lever to enter a cable car, but make sure it’s the right lever and not the one that just looks like the right lever because the model is bugged. Solve a sliding block puzzle for the third time, because that’s what counts as a lock around here. 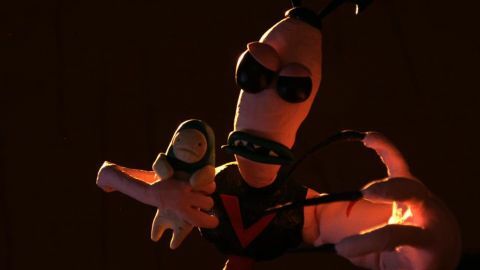 Armikrog is beaten through learned behaviour, not deductive reasoning. The chasm between Armikrog logic and real logic is embodied by the baby puzzle. Early on you find an abandoned infant, and to stop the blighter crying you need to complete a memory test, hooking toys to a mobile as an off-key jingle nibbles at your sanity. If the jingle completes a full rendition without anything falling, you receive a vital, story-progressing item. Otherwise, you have to rearrange the toys and sit through a tortuous encore. This vestigial excuse for a puzzle is wheeled out thrice to kill time. Armikrog treats the chain of causality with contempt, beholden to nothing but its own sporadic attempts to challenge the player. It succeeds in getting in your way. Your first encounter with any given puzzle provides the solution to the lot, if only you weren’t confronted with the arduous task of implementing it.